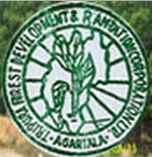 Tripura Forest Development and Plantation Corporation Limited (TFDPC) has issued a latest recruitment to recruit Corporation Forester posts. Who are eligible and interested candidates they can apply by downloading application form from TFDPC official site. Candidates also check other details related TFDPC Corporation Forester Recruitment 2015 like how to apply, selection process, salary, educational eligibility, age limit and more details are given below. Age Limit: Lower age limit shall be 18 Years and upper age limit shall be 40 Years. Age relaxation by 5 years is admissible in case of SC/ST candidates.